There's something evocatively surreal about skiing through downy powder snow, about floating downhill in snow so deep that it covers your skis, boots, ankles and lower legs. Skiers and snowboarders dream of cruising through untouched powder, of laying tracks where none exist, of seeing lower body parts disappear under a boil of downy-like fluff. The fluff of dreams. 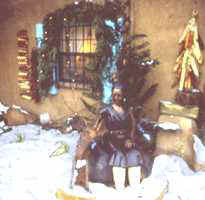 Dreamtime came true recently in New Mexico. Yes, New Mexico. Mention New Mexico and most people think of deserts, adobe homes and, especially for the geographically disadvantaged who confuse it with Mexico, a need for passports and bottled water. Savvy skiers know better. The "Land of Enchantment" offers plentiful high-elevation, snow-laden mountains with downhill ski and snowboard areas that vary from funky, family-run operations to sophisticated, upscale resorts. The common thread is beautiful New Mexico sun and views, coupled with often fantastic snow. Better yet, New Mexico's best skiing is within easy range of Santa Fe and Taos, towns seeped in the cultures of Native Americans and Spanish explorers and featuring colonies of artists. Skiing is often great in New Mexico, and the history, scenery, genuine friendliness, cultural diversity  and green-chili flavored food  make a visit extraordinary. I had the recent pleasure of a ski vacation which included four northern New Mexico ski areas near Taos and Santa Fe, Angel Fire, Red River, Taos, and Santa Fe ski areas, followed by skiing in the southern part of the state at Ski Apache. The diverse trip made for great explorations and some dreamtime skiing. One morning dreamtime was spent at the Angel Fire Ski Resort, where we joined "First Tracks," a program that offers skiers first dibs to ski powder before the lifts open. We all felt like heroes. 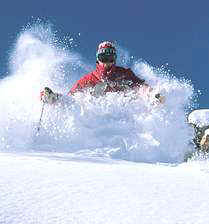 Powder is also called "hero snow" because it's possible for even intermediate ability skiers to tackle terrain that in other conditions would be too steep or too dangerously picketed with unforgiving rock-hard moguls. After notching a series of first tracks runs we tested the little-visited steeps of a run aptly named Nitro. Until Angel Fire adds a new chairlift, it's a mile hike. While I meandered down Nitros fallen trees and exposed boulders, a trio of true experts flitted like deer, hip-hopping down the fall line. 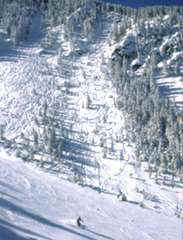 Angel Fire is unique among New Mexico ski areas because of its high-speed quad chairlifts. The nearly mile-long Chili Express zips skiers and riders more than 2,000 vertical feet to the 10,677-foot summit in minutes. A short drive away is Red River, where two-thirds of the skiers come from Texas and Oklahoma, the town features mom and pop motels, bars and steak houses. At Red River, one aspen-lined run designed for kids offers tree houses, wagons and a mining camp. 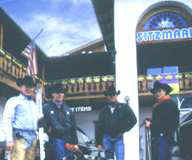 During my visit, I skied along with cowboys in chaps and Stetson hats. Wally Hobbs, Red River's ambassador, notes the area is anything but pretentious, catering to families, youth, and even "Bubbas." On another day we found plenty of powder after a storm unloaded 32 inches at Taos Ski Valley. Like heroes we variously glided or picked our way down runs we might not have otherwise tried, including Al's Run, an intimidating mogul-clogged route that goes under the resort's main chairlift, Hunziker Bowl, and Lower Inferno. 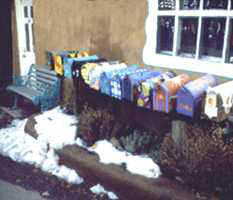 Taos is the stuff of serious skiing, legendary steeps and a ski village atmosphere that feels like the Swiss Alps. Taos remains one of the few U.S. ski areas that prohibits snowboards. Taos is internationally celebrated for its ski school, which includes popular weeklong sessions, where instructors are known for  and take pride in  teaching skiers to be aggressive. Just 16 miles north of Santa Fe is Ski Santa Fe, where the appealing mix includes spectacular mountain views at 12,000 feet above sea level and runs that range from swooshing chutes down rock-ordered routes, to wide-open cruisers, to plentiful beginners terrain. With a base elevation of 10,350-feet, the area is the second highest in North America (Arapahoe in Colorado is the highest). 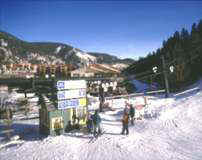 At the other end of New Mexico, 195 miles south of Albuquerque, is Ski Apache, American's southernmost major ski area. Located on Lincoln National Forest and Mescalero Apache land, it's one of only two U.S. ski areas owned and operated by an Indian tribe (the other is Sunrise in Arizona). Because Ski Apache is closer to Texas and Mexico than Albuquerque, the languages spoken on its slopes range from Spanish to even harder-to-decipher Texas-twang. Among New Mexico's joys are its off-slope activities. In Taos, the possibilities include touring the fascinating downtown, visiting the Taos Pueblo, staying at its many bed and breakfast inns, and dining. On or near slope, the culinary possibilities include the Hondo Restaurant at The Inn at Snakedance, Dolomite, Austing Haus and Hotel Edelweiss while in-town are Eske's Brew Pub, The Trading Post, and the exquisite gourmet restaurant, Momentitos de la Vita. In Santa Fe, visit the Plaza, downtown and the many stunning art galleries on nearby Canyon Road. Santa Fe offers an elegant choice of restaurants, including La Posada, the Inn of the Anasazi, La Casa Sena, and Maria's New Mexican Kitchen, which features an intoxicating selection of more than 50 margaritas. Skiing in New Mexico? You bet. No, a passport is not required, and, yes, you can drink the water. 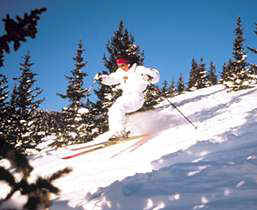 Click here to plan your own ski trip to New Mexico.